The two Grand Tasting tents at Wagner Park were up Monday morning but had been removed by the end of the day. The city plans to have the park open to public use by the end of this month. The exodus of foodies and spirits lovers from Aspen meant Wagner Park was in breakdown mode Monday as the city aims to have the park open to the public by the end of the month and in time for Fourth of July festivities. 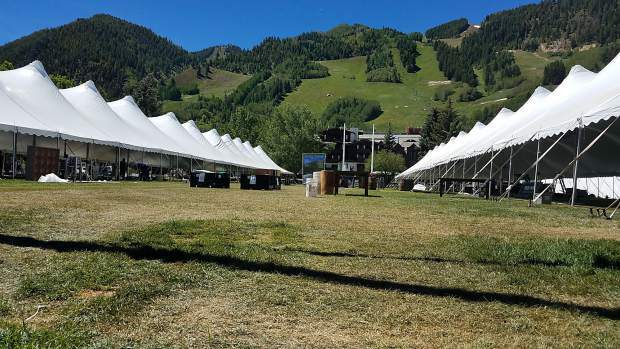 Wagner Park, home to two Grand Tasting tents, was ground zero for the Food & Wine Classic in Aspen, the annual event that signals the beginning of the peak season for tourism. The event ran Friday through Sunday. This week, city workers will put in sand and level the field to ready it for resodding next week, city officials said. By Monday’s end, the tents had been broken down. “If all goes well and according to plan, we’ll open the field that evening (June 30),” said Matt Kuhn, operations manager for the city Parks Department. From June 27-29, the city will strip the park and install the sod that will be hauled in from the Front Range. Barring any torrential rain storms, the sod will be installed in time for it to open in advance of Independence Day, said Kuhn and Austin Weiss, the city’s director of Parks and Open Space. Wagner Park is a popular venue for watching the Fourth of July fireworks display over Aspen Mountain, which is set for 9:15 p.m. The park also flanks Mill Street, where the Dancing in the Streets party will be held from 8 to 10:30 p.m. July 4. “We want to get it open as soon as possible,” Weiss said. The entire cost of the project is $93,724, Kuhn said. Food & Wine organizers are contributing $35,000 toward the cost, and the city will pay the rest, he said.